The cartoon in Israel’s popular daily Yedioth Ahronoth probably sums up the view of most Israelis since Nikki Haley’s announcement Tuesday that she is leaving her position as U.S. ambassador to the United Nations. Haley’s announcement at a news conference with President Trump, which was aired live in Israel on Tuesday, immediately drew an outpouring of appreciation for the former South Carolina governor, who has long been viewed here as a savior of sorts at an institution accused of harboring a long-term bias against the Jewish state. “I thank Ambassador Nikki Haley for leading an uncompromising struggle against the hypocrisy at the U.N. and on behalf of the truth and justice of our country. Best of luck!” Israeli Prime Minister Benjamin Netanyahu wrote in a statement. Netanyahu, who has long criticized the United Nations, calling it a “theater of the absurd,” hailed the U.S. withdrawal from the U.N. Human Rights Council in June as a victory for Israel. It was not the only time Haley appeared to advocate for Israel. She also is thought to have been a major force behind the Trump administration’s decision last month to cut all funding to the U.N. Relief and Works Agency, which provides aid to 5 million Palestinian refugees scattered around the Middle East. Haley visited Israel only once during her time as U.N. ambassador, in June 2017, but during the three-day stay she received somewhat of a hero’s welcome, meeting with an array of Israeli officials and being treated by the Israeli military to a helicopter ride over the blockaded Gaza strip. “You know, all I’ve done is to tell the truth, and it’s kind of overwhelming at the reaction,” Haley said during her visit to Israel. “If there’s anything I have no patience for, it’s bullies, and the U.N. was being such a bully to Israel, because they could,” she said. 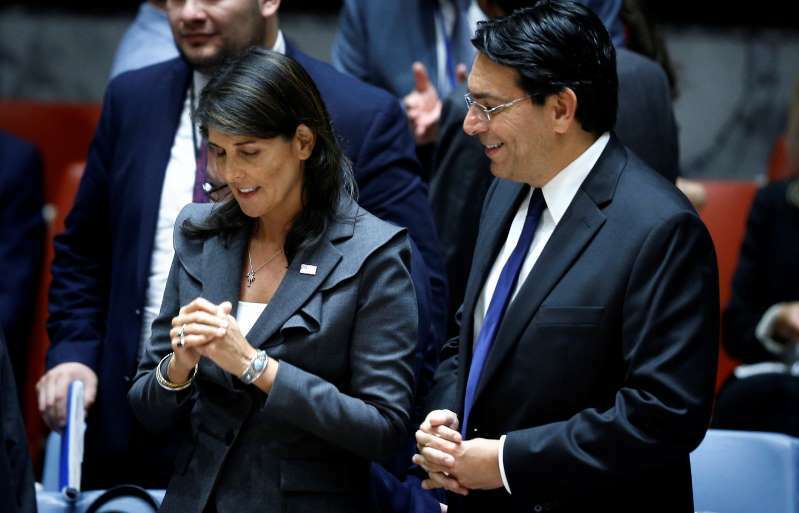 Writing in the Israel Hayom newspaper on Wednesday, Danny Danon, Israel’s representative to the United Nations, said Haley’s time in the international agency marked a “new era” for Israel. “For years, we had become used to regarding the UN as an institution that contained the lies, distortions, and half-truths spread by the Arab states and our enemies around the world,” he wrote. “It was a period in which the terror machines of Iran, the terrorism of Hamas, and the lies of the Palestinian Authority were revealed to the world and showed the true faces of our enemies." But not everyone in Israel is sorry to see her go. Ahmad Tibi, a member of the Arab faction in Israel’s parliament, wrote on Twitter that Haley’s resignation should stand as a warning to the Israeli government: “I know that some will have a hard time believing it, but Trump will not stay here forever either." World - U.S. Daily News: With Haley’s departure, Israelis joke they will have only one ambassador at the U.N.